The veteran midfielder will end his 15-year spell with the Paisley club at the end of the season. St Mirren manager Danny Lennon has praised midfielder Hugh Murray after announcing the veteran midfielder will leave the club at the end of the season. Murray, who has spent 15 years with the Paisley side, made his debut in 1997 and went on to break the club’s appearance record. The 33-year-old has played 467 games for Saints winning more medals than any other player for the club after picking up two Scottish Football League First Division winner’s medals (1999/2000 and 2005-2006) a Challenge Cup winner’s medal in 2005/06. Praising his contribution to the club, Danny Lennon told St Mirren’s official website: “Shuggy has set himself in the record books at a club he has served terrifically well for 15 years. In the modern era, it is rare for a player to spend his whole career at the one club. I think that is to be praised and commended. “Shuggy has now thrown down the gauntlet to our emerging young players, such as Jason Naismith and Thomas Reilly, encouraging them to be the next players to serve the Club impeccably well in the years to come and to achieve legendary status at a Club that is steeped in 135 years of rich footballing heritage. 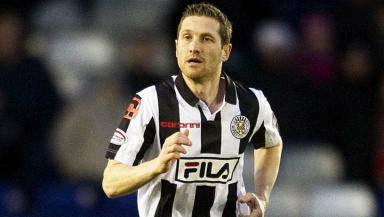 Murray, who was capped at both Under 16 and Under 21 level for Scotland, is part of St Mirren ‘Hall of Fame’ and had his testimonial season in 2007/08 with a match against then Premier League side Derby County. This season he has found first-team opportunities hard to come by, making eight appearances with six of those from the bench.